It’s an almost book review for two reasons: 1. I haven’t finished the book. Of course, I am certain many reviewers — ones who get paid for their reviews, even — don’t always finish the book they are slated to review. 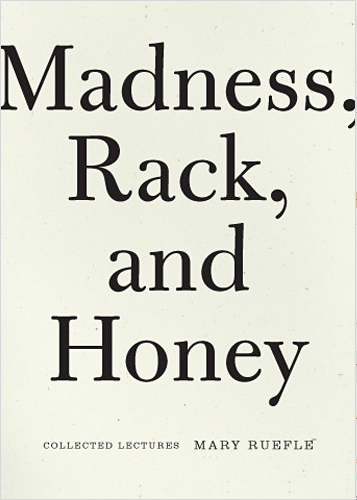 In my case, the early review is reasonable since Madness, Rack, and Honey is a collection of essays (in fact, most were graduate lectures given by Ruefle) and is suitable for reading at multiple sittings. After all, the lectures presumably were given over weeks, months, possibly years. In my case, the essays are being read over multiple bedtimes and in between other readings, both required and not. This is an “almost book review” for a second reason and that is because I have a motive in reviewing this book on my blog: I want a good reason to share a particular passage with you that struck me last night. I want to make you read the passage, see if you feel it like I did, and then listen to your footsteps as you run to go order Madness, Rack, and Honey (Wave Books) for yourself. It’s such a pretty thing; opt for the hard copy. Don’t be scared off by the fact the book was distinguished as a 2012 National Book Critics Circle Award finalist in Criticism. Ruefle’s lectures were written with people in mind, students in particular, not necessarily academics; but students who love to read, students who are compelled to write, students who paid for a degree in Fine Arts. This I relate to. In my imaginary ideal world, I would write out everything I want to say in advance of saying it and be cued by cards. I don’t long for a guardian angel to protect me from dangerous criminals; I need one to protect me from my impulsivity, my unedited self. I want an angel who can hold cue cards in front of me wherever I go; cue cards I’ve written in advance for the occasion, carefully crafted words. I first discovered the book after enjoying Ruefle’s essay On Secrets, assigned to me in a writing workshop. When I realized the essay was part of a collection, I looked it up and discovered that many of the collected lectures speak to recurring topics and themes in my own writing — On Beginnings, On Sentimentality, On Fear — or topics I spend much of my day ruminating over, but not necessarily writing publicly on, such as the portents or prophesies that appear in my dreams. Apparently this happens to Ruefle, too. I connect to Ruefle’s style and voice, too, which is extremely self-aware throughout most of the essays. She appears to think out loud, to ponder, even though she has already told us she writes out everything in advance. No word, we can assume — not any of the seeming extra ones even — fall out of Ruefle’s mouth unintentionally. And yet, her voice is often unsteady, down-to-earth, human. She stands there in front of her audience an expert, but one who outright identifies herself as just another daydreamer, just another poet with questions for the universe. The book is a gem, and I’m only half-way through. The particular gem that compelled me to share the book with you relates in particular to the writing project I’ve been focusing on for the past 10 months and sometimes blogging about: Digging through the artifacts of my Self — my letters, my journals, evidence of my creative self — and discovering the ways in which I’ve changed and the ways in which I’ve remained the same even though I previously thought I changed. Recently I was reading the notebooks of the Greek poet George Seferis. I was also reading, for the first and last time of my life, my own private journals, which I began writing when I was 16 and ceased to write when I was 40. As is my habit, I was copying selected passages from the Seferis into a notebook. Later that evening I began reading a journal I kept 20 years ago. In it I was reading the the notebooks of the Greek poet George Seferis and had copied into the journal by hand my favorite passage, which was identical to the passage I had copied earlier in the day, believing completely I had never encountered it before: But to say what you want to say, you must create another language and nourish it for years and years with what you have loved, and with what you have lost, and with what you will never find again. The Sefaris passage made me want to cry. But that aside, I’ve had similar experiences of discovering, somehow, that a part of me is still the same x number of days, or weeks, or years later (the longer the time period, the more stunning, of course), and it always occurred to me as an intimate comfort, like touching my old blanky… something that’s only between me and me. I love those experiences. Thanks for sharing this.